Tomoko Tanaka Mao was born in Nagoya, Japan. She started playing the piano at the age of 3 and the violin at 4. At the age of 7, setting the record for their youngest ever winner, she won first prize of the Kumaniti violin competition. Other of her many awards and prizes include the West Japan Rising Star Musician Award and the New World Symphony Concerto Competition. After graduating from the Aichi Prefectural University of Fine Arts and Music in Japan, she went on to achieve a Master's Degree in Music from the New England Conservatory in Boston. Her illustrious list of teachers include Pinchas Zukerman, Vladimir Spivakov, Masuko Ushioda(pupil of Joseph Szigeti, Toru Yasunaga(Concertmaster of the Berlin Philharmonic), Marylou Speaker Churchill(Principal of the Boston Symphony Orchestra, and Koichiro Harada(First violin of the Tokyo String Quartet). She also studied chamber music under the tutelage of the Bartok Quartet and the Cleveland quartet, and with Eugene Lehner of the Kolisch Quartet. At the New World Symphony Orchestra, she was appointed by Michael Tilson Thomas as Associate concertmaster, a position she also held at the Middle Japan Orchestra and substitute player of Nagoya Philharmonic Orchestra. She joined the Hong Kong Philharmonic in 1997. 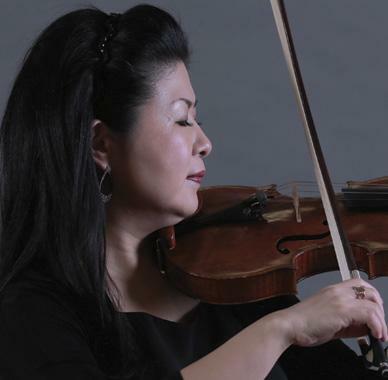 As an experienced orchestral and chamber music player, she has performed around the world in major cities of Japan, China, Korea, The U.S.A. and Europe. She was concertmaster of the Pacific Music Festival in Japan as well as performing with the New England Conservatory Chamber Orchestra and taking part in the Aspen Music Festival. As an experienced chamber musician, she has performed with members of the Berlin Philharmonic and Boston Symphony Orchestra. As a soloist, she has held recitals in Hong Kong, Japan and Italy.